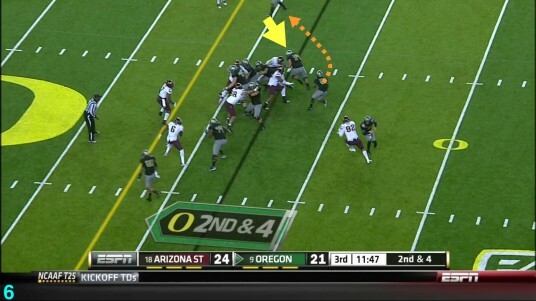 The FishDuck Minute #11: Oregon has a Trap Play! 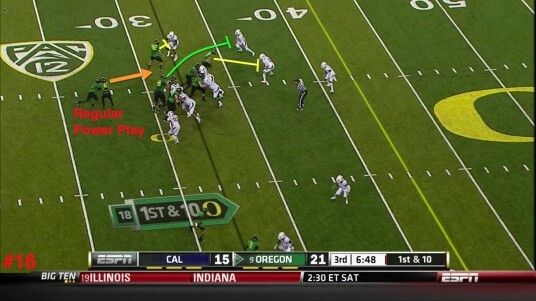 Oregon has shown a number of Inside Zone and Power Plays in the past and I always kept an eye out for a classic Trap Play. I never noted one until going through games of 2011—and there it is! The Chip Kelly Spread Offense has a Trap Play in its Offensive arsenal, and it’s fun to see how it is a different play from the Power Play. Note how we pull a guard, (Asper) against Cal (Above) who then goes down the Line of Scrimmage to turn up field and blast a linebacker and create a hole for Barner. 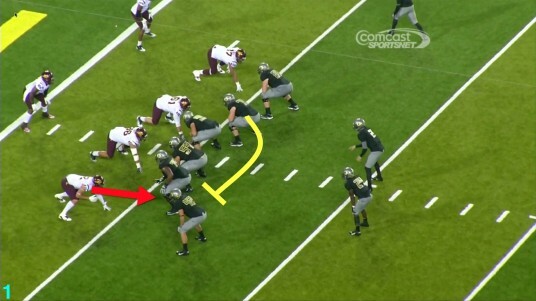 Of course the entire line (Above) made key blocks, but the pulling guard on the LB makes the critical one. Seeing the lane created by the sealing blocks of Paulson, (#42) and Lyerla, are a wonder to behold. 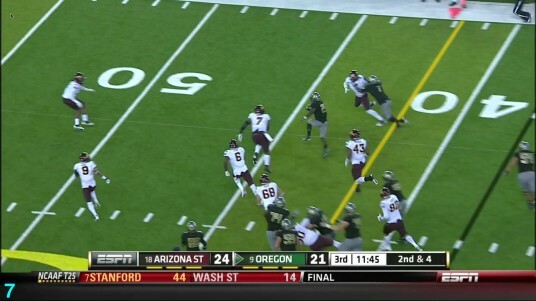 Against Arizona State we see Hamani Stevens pulling to block the Outside Linebacker of the Sun Devils. Our offensive guard, Stevens, is meeting the linebacker at the corner and blasts him to create the outside lane for Barner to get good yardage. Barner has broke into the secondary from Hamani’s big block and this serves to wear down a defense through the game. In both cases we are blocking ALL the defensive linemen and using the pulling guard to nail the LB on the outside. So these are POWER PLAYS. 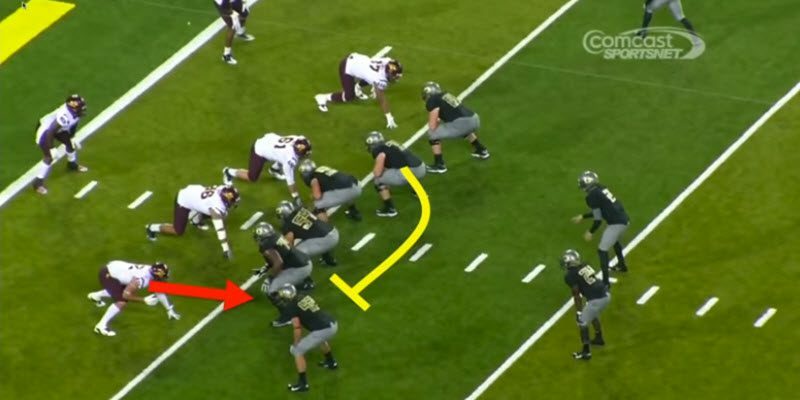 Against Arizona State we have the guard pull and block a down defensive lineman—which is something we don’t do with the Power Play. We are leaving the DE unblocked and instead of Zone Reading him—we are trapping him! Weems (#74) will move inside and shove their star MLB out of the way to create a running lane for Barner. The execution is wonderful as York traps the DE, Weems pushes the ASU MLB from the lane, and Barner runs right up the middle of the defense for a Touchdown! 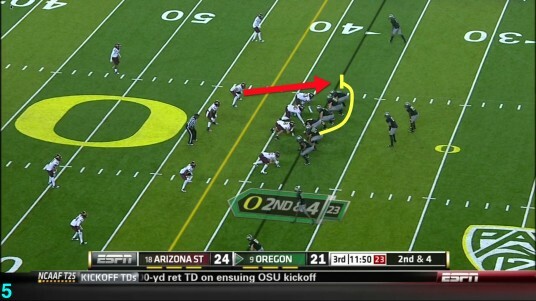 So there we have it; Oregon does have a seldom-used Trap Play! I see it as a nice changeup to mess up defensive linemen that much further. First they have to follow their defensive assignment of there are not being blocked, but Zone Read. Then if they “sit” they get blasted? 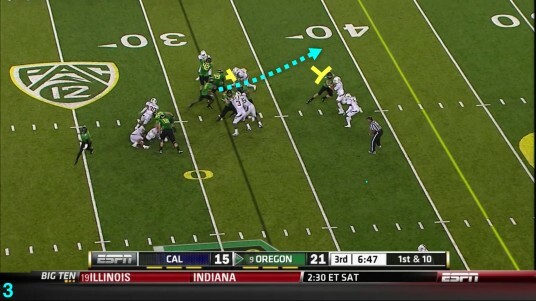 They have to be looking everywhere, and that creates more hesitation, which helps the Oregon Offense that much more! It will be interesting to watch for when he pulls it out of the playbook again.